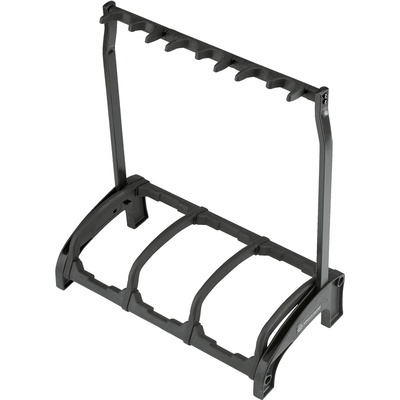 Product #46666 | SKU 17513 | 0.0 (no ratings yet) Thanks for your rating! The black 17513 Guardian 3, Three-Guitar Stand from K&M holds three acoustic or electric/bass guitars securely. It can be used to save space, and it allows for an unobstructed view of your instruments in recording studios, at home, on stage, in stores, and more. Protective bars stop the guitars from rotating and prevent inadvertent removal. They also prevent bumps or knocks when removing the instrument from (or placing it on) the stand. Soft pads made of high-quality thermoplastic elastomer provide cushioning and support the weight of the guitar, which prevents damage to the instrument. Also, the folding mechanism allows the Guardian to be carried easily and enables it to stand upright against a wall. Additionally, the subdivided support arms are built with integrated pick holders, and each guitar can be held from either side—right or left—with the strings untouched. Finally, the Guardian 3 is made of high-quality elastomer plastic, which will not damage most guitar lacquers, including nitro lacquer.